Bombardier Aerospace is hiring for many positions in various locations throughout the U.S. At Bombardier, over 69,500 employees work together to move people forward around the globe—one good idea at a time. We’re a global transportation company with 73 production and engineering sites in 28 countries, and a worldwide network of service centers. Jet International is looking to hire! Job opening for an Account Manager at JET International. See flyer for the detailed job description. You can find out more at jetinternational.com or email smachala@jetinternational.com. Job opening for Operations Specialist at the Peoria International and Mt. Hawley Airports. See flyer for information on how to apply or you can apply to golson@flypia.com. Duncan Aviation has career opportunities available in many locations. View the current openings. The College of Applied Sciences and Arts (ASA) at Southern Illinois University Carbondale is seeking qualified applicants for anticipated positions within ASA’s Aviation Flight program. These are 9-month, non-tenure track appointments. The College of Applied Sciences and Arts at Southern Illinois University Carbondale is seeking qualified applicants for anticipated variable time, term, non-tenure track faculty positions within ASA’s Aviation Management program beginning as soon as possible. The College of Applied Sciences and Arts at Southern Illinois University Carbondale is seeking qualified applicants for anticipated positions within ASA’s Aviation Flight program. These are term, non-tenure track appointments. 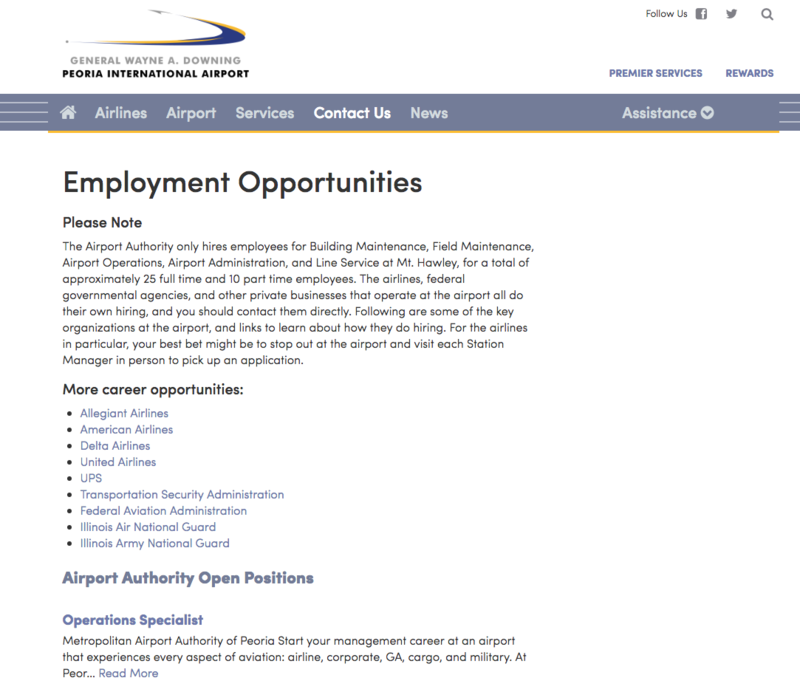 4 positions available at IAD. As a Ramp Controller and Mobile Lounge Dispatcher, you will control aircraft on the ramps and taxi lanes, dispatch mobile lounges to safely transport passengers, and monitor all aircraft and vehicles in the ramp area to ensure their safe, efficient, and expeditious ground movement. This position is in support a Department of Defense program for the U.S. Government. Applicant must be a U.S. citizen. The specialist will produce terminal procedures for military flights such as departure, arrival and approach charts using MicroStation (CAD software). Candidates will have familiarity with instrument flight, flight information publications, and must understand aeronautical concepts. Training is provided, but previous experience with CAD software, an instrument flight rating, or prior air traffic control experience is a plus. USAIG - America’s First Name in Aviation Insurance -- In 1928, two enterprising pilots developed the idea of offering specialized insurance to the aviation industry. Working diligently, they established USAIG, an insurance pool composed of insurers dedicated to providing expertise in aviation underwriting and claims handling. Our tagline is far more than just a marketing slogan – it’s literally true. USAIG quickly became and today remains a leading insurance provider to all segments of the aviation and aerospace industry. United States Aviation Underwriters, Inc. (USAU) manages an insurance pool of member companies, United States Aircraft Insurance Group (USAIG) and underwrites on behalf of the member companies within the USAIG pool. For more than nine decades, we have been a leading provider of insurance to the aviation and aerospace industries. We are a subsidiary of General Re Corporation, a leading global reinsurer, and a member of the Berkshire Hathaway Inc. family of companies. SSE is a St. Louis based technology company that designs and builds training and courseware for military and commercial aviation programs. There is an immediate opportunity Technical Publications Writers to assist in the design and development and revision of Technical Publications, Computer-Based Training (CBT), Instructor-Led Training (ILT), Courseware Development and related materials. Technical Publication Writers will follow formats and templates as required by a program and when required may develop appropriate document formats. Works under moderate supervision in a team environment. For more information see flyer for information. Several AmeriCorps positions are available in a social service agency (LSSI) located in Marion, Illinois. AmeriCorps is a civil society program engaging adults in public service work with a goal of "helping others and meeting critical needs in the community." Members commit to part-time positions offered by a network of nonprofit community organizations. The program is often seen as a domestic Peace Corps. See Flyer for more information. The Air Force Academy High School is one of 6 military academy high schools within the Chicago Public Schools and the only public, entirely Air Force Junior Reserve Officer Training Corps Academy in our nation out of over 800 Air Force JROTC programs offered in the US and at US military installations overseas. Our school is located on the south side of Chicago directly beside the Chicago White Sox baseball stadium. This could be a great job opportunity for a qualified individual who enjoys working with high school students to share their knowledge and experience in aviation with Air Force JROTC Cadets interested in exploring the world of aviation. Our Academy is also getting flight simulators installed here this summer which will help make the program more engaging for both Cadets and the Instructor alike. In the meantime if you have any questions or would like any additional information please send all inquires to the POC listed in the attached job description. NCAC is looking for applicants for Chief Pilot. Click here for more information.